This flatpacked bow and arrow set in its target box is suitable for children aged 5 and up. Toy made of certified wood from sustainably managed forests. Made in France. - Warning! Not to be used by children under 5 years. - Warning! Product may contain small parts which can be swallowed: choking hazard. Since 1911, Vilac has been making traditional wooden toys in a factory set in the French Jura Mountains. Using timeless designs in bold colours, Vilac creates hand-crafted toys with high-quality wood and unique lacquer, that all members of the family will fall in love with! Vilac nourishes children's imaginative play with animated, joyful characters and reinterpretations of classic toys that will stand up to wear and tear. Vilac toys are also made using wood from sustainably managed forests, with respect for the environment and the planet, whilst guaranteeing a maximum safety for children. 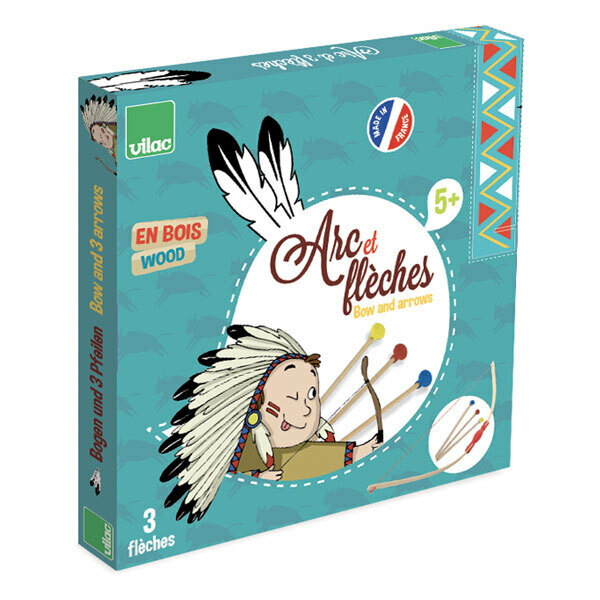 Discover our selection of Vilac toys!